Alfa Romeo, after making a very accidental photo debut, let loose the first official images and information about the upcoming Giulia. And she’s a looker, for sure. Truth has to be told at one point of our life, isn’t it? 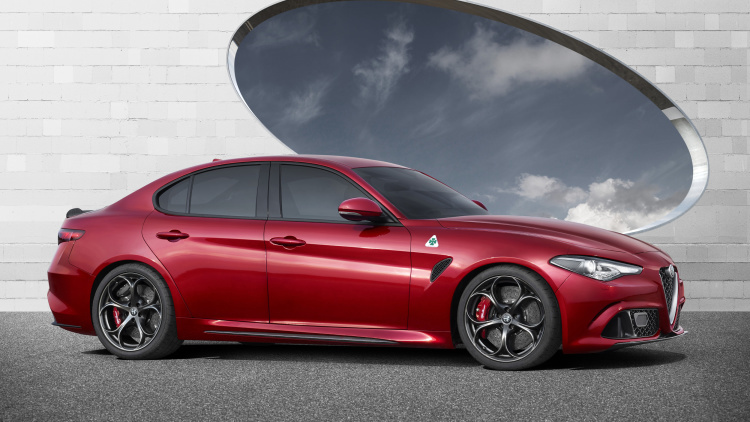 Alfa’s rakish new sedan certainly offers enough performance to justify the fast-standing-still styling. The car’s turbocharged V6 produces 510 horsepower (we’re assuming that’s a metric figure), and pushes the car to 62 miles per hour in just 3.9 seconds. That’s the top-of-the-line engine said to be introduced on the high-performance Quadrifoglio version of the car. That quick acceleration is at least partially down to a very impressive curb weight. Alfa hasn’t given us an official figure, per se, but does mention that the Giulia has a weight-to-power ratio “lower than 3kg/hp.” Doing the math, that would put the Italian under 3,400 pounds, which is impressive? We know from Alfa’s US-spec 4C that the sedan might gain a bit of heft in its cross-Atlantic translation, but if it’s even in that ballpark, we’ll be excited. Weight distribution is 50:50, and there’s a lot of effort to reduce that overall mass. Carbonfibre is used amazingly extensively: propshaft, roof, bonnet. Not only the suspension and subframes are rendered in aluminium, but the doors and wings too. Overall weight is about 1500kg, which is very tidy for a car of this kind. Brakes are carbon ceramic. The body is said to generate downforce: at the front there’s an active splitter, while at the rear you’ve got a huge diffuser and four fat tailpipes – de rigueur hot-saloon tropes. Pitted as a competitor to the BMW 3 Series, he Giulia will be available as a rear-wheel-drive vehicle as standard, of course. But an optional all-wheel-drive setup is also in the cards. It features a rear differential with torque vectoring, an active front splitter to maximize aerodynamics at high speeds, and something called Chassis Domain Control to run all of the systems. The Giulia even gets F1-style knobs to adjust all of the adaptive settings, mounted on the steering wheel. 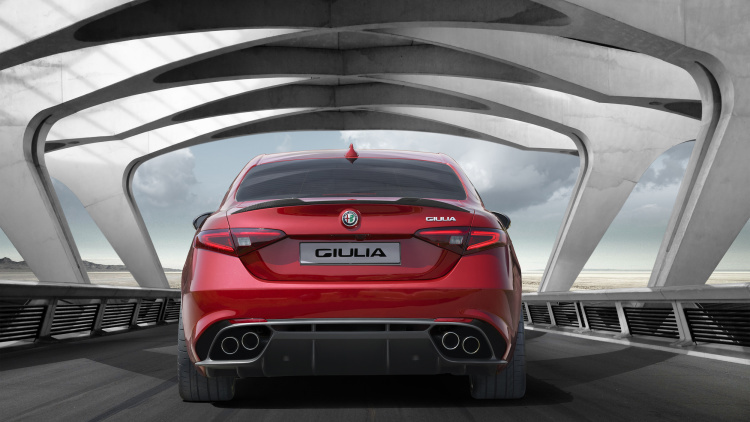 The Giulia goes on sale in the UK in September 2016. Hold tight for more info. The unveiling today was a very tightly-controlled and info-light event in Milan; we will be gathering more over the next hours and 4wheelreviews will have updates soon.